want to cheat and when the power of sorcery is over, it's believed that the money and the jewellery would turn into onions and garlic. In one other belief, it's believed that if you rub garlic or onion under your shoes on new years eve, neither snakes nor scorpions may harm you. I wrote this paragraph to a group this morning. Then I decided to continue from here for the new update. At the beginning, I thought I could write more often but as time goes by, I realized that it takes more time and effort than writing in my own language. So each time I sat on my chair to write something in English, I found myself doing other things rather than writing for my English blog. I actually even found topics to write about. One was ‘simit’ (the round, crispy bread with lots of sesame seeds) which is one of the ‘staple’ foods (really!) for Turks. Simit-kasar-çay is like Daltons for us. You cannot seperate one from the other. Simit, I told about. You can see ‘simitçi’ (simit seller) on Istanbul streets. It can be eaten at any hour. For breakfast, for lunch, for afternoon tea, even for dinner! Kasar is our wonderful cheese which is somehow like gruyer or cheddar cheese but it’s different. Let me give you the explanation from Suzanne Swan’s wonderful book, The Treasury of Turkish Cheeses (Boyut Publishing, Istanbul, Turkey, 2004): “This is Turkey’s best-known and most popular cheese. It resembles a mild or medium Cheddar and they both have the same pale yellow colour and texture and gain their unique flavour after being left on shelves to mature over several months. Eski (Old) Kasar, produced in wheel-shaped moulds, mostly around Van and Kars. 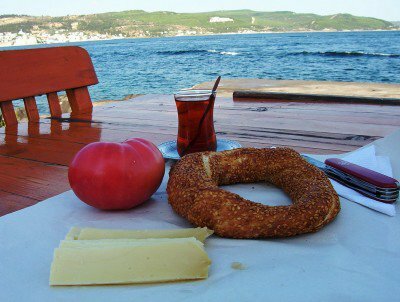 The cheese seller cuts off as much as you require.” Çay is of course, our beloved tea which can be drunk at an hour of the day, with or after the meals but especially for breakfast. In summer, tomatoes are wonderful additions for this trio. Yes, this was one of the subjects but I actually wanted to talk about the wonderful wild greens of Turkey. There is so much to tell about them. 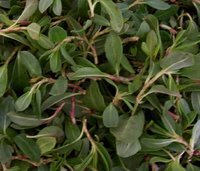 For my book A Tale of Wild Greens I researched on over 50 of them but if you go deeper and on regional scale, you can find easily over 200 edible greens. 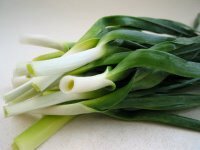 Sometimes shoots are eaten, sometimes roots or leaves. You can either boil them and eat as a salad or fry or saute with onions and some other ingredients. 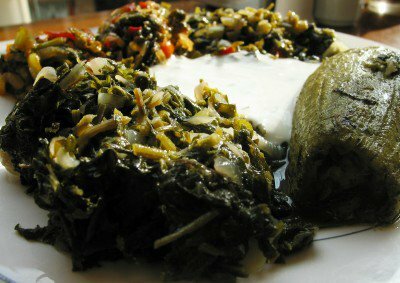 Cooking the greens with bulghur (or rice) is another way of using them. You’ll see an example for this dish at the end of this post. Böreks are also special for Turks. 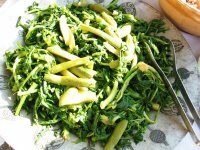 So wild greens are used in many regions and in many different börek (phyllo dough dishes) recipes. 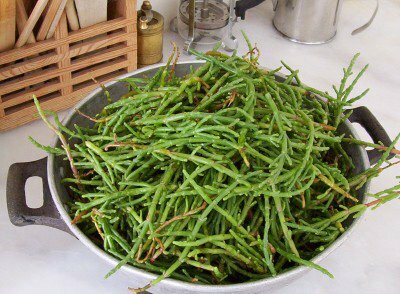 You can add them in breads, cook with grains or legumes... There are so many ways of cooking them. What are the most popular greens of Turkey? As I said there are so many of them but here I’ll name few of them: hodan (borage, borago officinalis), kusotu (chickweed, stellaria media), arapsaçi (wild fennel, foeniculum vulgare), yemlik (goat’s beard, tragopogon spp), kenger (milk thistle, onopordum or scolymus spp), madimak (polygonum cognatum), ebegümeci (mallow, malva silvestris), turpotu (white mustard, sinapis alba), tilkisen (wild asparagus, asparagus acutifolius), isirgan (nettle, urtica dioica), gelincik (poppy, papaver rhoeas), kuskus otu (shepherd’s purse, capsella bursa-pastoris), kuzukulagi (sorrel, rumex acetosa), hindiba (taraxacum officinale), köremen (wild garlic, allium spp)... These are only the few of a wide variety of greens. We also use oregano, thyme, sage, marjoram, laurel leaves both in cooking and to make herbal teas. They’re and so many other wild herbs and aromatic plants are used for healing too. Heat oil in a pot, add onions and leeks. Saute them for 10 minutes on medium heat stirring once in a while. Add cleaned, washed and cut greens and cook for few more minutes. Then add washed and rinsed bulghur, hot water, salt, pepper and red pepper and cover the pot. Lower heat to very low and cook until all the water is evaporated. You can serve this meal with yoghurt or ayran** or with meats. * You can find bulghur on health food stores or stores where Turkish or Middle Eastern ingredients are sold. ** Ayran is a summer drink which we love. It’s made with yoghurt, water and a bit of salt. All you need to do is to beat the ingredients until it becomes foamy. It’s preferred cold. Istanbul is a place to be, when it comes to tasting special food from different regions of the country. Not only regional tastes but also the international tastes can be easily found. Do you want to eat Mongolian? You can find it. Japanese? Sure. Chinese? Ooo, so many restaurants! Brazilian, Austrian, Spanish, Korean, Italian... We can look into the international tastes later but today I want to tell about the little and very special cafe and take-away which is owned by a warm and wonderful family. I met Basar family last year. I was writing for Radikal newspaper then. (I was writing articles on the special tastes of different regions.) 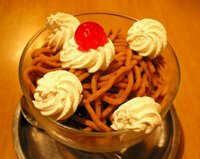 On one of my articles, I wrote about a sweet. Just after the article’s published, I got an e-mail from Tanil Basar, who’s the father of the family. He was telling that they’re from Rize (a coastal city on the Blacksea Region) and they opened a small cafe where they sell special tastes from Rize. 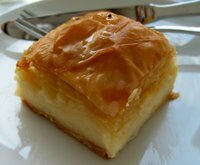 Among them are ‘laz tatlisi’ (or ‘laz böregi’ as known by some) which is kind of a baklava but instead of walnuts or pistacios, they put a vanilla pudding in the middle. 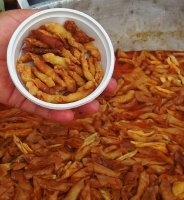 This sweet is a regional one and not so many people know about it. (By the way, ‘Laz’ is the name of a minority group in Turkey. Most of the groups who live in the Blacksea Region consider themselves ‘Laz’.) ‘Laz böregi’ can therefore be translated as ‘the borek of Laz’s’. 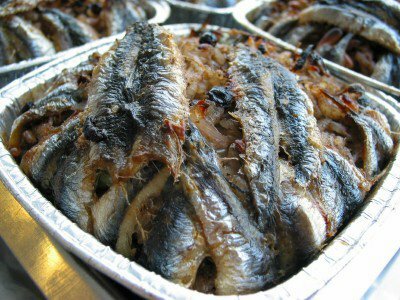 They serve ‘hamsili pilav’ (or ‘içli hamsi’ as they say) which is a baked dish (as is shown on the first picture) made with anchovies. This dish has a special rice filling where rice is cooked with currants, pinenuts, greens and some spices. First anchovies are cleaned. Half of it needs to be arranged in a row, then the rice is added and on top of the rice you arrange the remaining of the anchovies (called ‘hamsi’ in Turkish). Then it’s baked in the owen and be eaten with joy. Hamsi is quite special for the Blacksea people. It’s the staple food for them along with corn flour and beans. They have so many dishes that is made with anchovies and this little fish got into jokes, poems, folk songs, stories etc. They even make sweets with it, although I haven’t eaten it. The corn bread that is made with greens and anchovies is another special dish which you can find at Trize, the small cafe of Basar family. Today I took two of my friends there and we had anchovy dish that is filled with rice, cheese borek and stuffed kales. After our meal we tried the ‘laz boregi’ and the pumpkin baklava.All of them were perfect. My stomach is still happy from that meal. Some people do business just to make money. Basar family does it to make people happy and they serve nothing that they wouldn’t serve to their guests. I hope similar people will flourish around the world. I guess the wars will end then and friendship will spread over the world! Put 4.5 cups of flour in a big mixing bowl. Add the salt and a glass of water and start mixing it with your hand. Add the remaining flour slowly as you need while you’re kneading. Prepare a soft dough and divide it into 18 pieces, make balls, put a clean kitchen towel on it and leave for few minutes. During this time mix the vegetables with the meat, black pepper and a little salt. Add the remaining water and mix. Spread a little flour on the rolling table and start rolling each dough as thin as possible. Spread a piece of filling on one half of the dough. Then cover the other half on that half and press the sides with your fingers. If you have a large teflon or iron skillet, heat it on medium fire, spread a little bit of melted butter or oliveoil on both sides and cook both sides for few minutes (or until it becomes golden brown on both sides). You can make smaller or bigger pieces depending on how big your skillet is. You can try to bake them in your owen too. spices called 'külünçe'. This bread used to be baked before one of the sons of the family is farewelled for the military service. The boy would eat a piece of it then the bread would be hanged on one of the walls. Whenever the family receive a letter from him, after it's read, it'd be attached on that bread. So the bread becomes a frame here. When the boy comes back, he'd be asked to have another piece from the bread and the rest of it is given to the birds. There is so many other traditional information that I found during the research period of this book. So many exciting bits and pieces. I included all the new year celebrations (Nawrouz is another one of it which is celebrated on the 21st of April), religious holidays, seasonal customs etc. The first one is 'acur tursusu'. Acur is a kind of cucumber which is grown widely in the southeastern part of Turkey. It has a lighter colour and is thinner but longer than cucumber. The Latin name of it is Cucumis anguria and the known English name is 'gherkin'. I took this picture in Mardin, another southeastern city. This is a recipe I got from a family in Mardin. It is a pickle which is made with coriander seeds. A tasty one. Second one is a 'cacik' recipe. 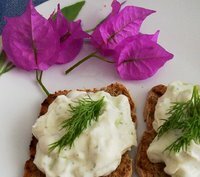 It is made with yoghurt, garlic, salt and cucumbers mostly but this recipe has hazelnuts and is usually made in the Blacksea Region. Hazelnuts are grown widely in the Blacksea Region of Turkey and as you might know, Turkey is number one hazelnut grower in the world and exports hazelnuts to so many countries. The last one is a special dish which is called 'düdük'. Düdük's dictionary meaning is 'whistle'. 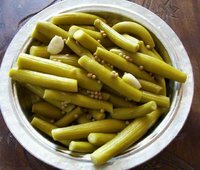 This recipe is from the Çanakkale Region. 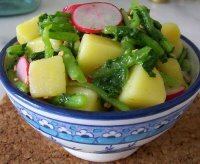 It is a special wedding recipe and it's said that all families include this recipe for their wedding dinners. 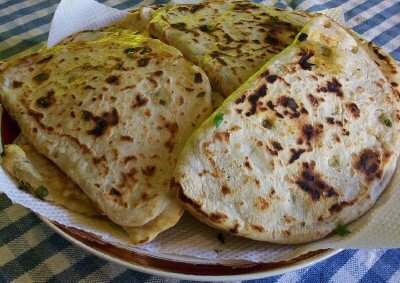 It is a kind of 'manti' (or ravioli) which is prepared with a similar dough as pasta. It's cut in small squares and given shape like a whistle. The dough is fried then. Afterwords it's cooked with chicken pieces and chicken stock and served in soup plates. Please feel free to ask about the book and it's content. I'd very much like to see it translated into other languages so let this be the wish for 2006. * Let me thank my brother Cem and friends Fethiye, Pinar, Asli, Mine, Saikal, Mirace, Basak for their support for the photos. More friends helped with the recipes. I thank them too for their support and friendship! Here is the second post for my English site. I decided to use that picture since I wanted to show the beauties of Istanbul while I’m telling about the tasty stuff from the city. 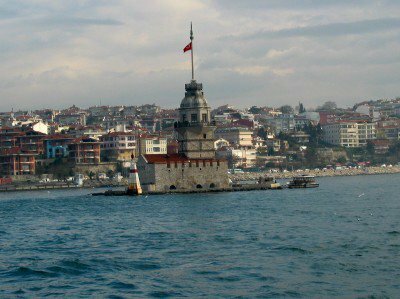 Kiz Kulesi (Maiden's Tower) is one of the monuments that you see when you cross the Bosphorus by boat. I took this picture yesterday while I was on the boat from Besiktas to Kadikoy. The goal was to visit a wonderful restaurant called Çiya (http://www.ciya.com.tr/) to meet the chef and the owner of the restaurant, Musa Dagdeviren. He was at the CIA’s (Culinary Institute of America in California) yearly festival last November where he introduced special (and some of it is long forgotten) tastes of Turkey. For more information you can download the pdf document of the ‘Ancient Fires, World Flavors & the Future of American Cooking (http://www.prochef.com/WOF2005/pdf/WOF2005a.pdf) which Musa attended. Each time I go there, there is always something new for me. This time I had a stuffed zucchini dish called ‘kündür dolmasi’ and a sweet called ‘belluriye’. The sweet is like kadayif but the difference is that the dough includes milk instead of water and the cooking method of the sweet is different. I definitely like this better than the regular kadayif since it is lighter than it. 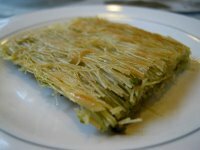 Kündür dolmasi is made with an onion-potato stuffing and was delicious. My all time favorites at the restaurant are felafel and ‘fellah köftesi’ (bulghur balls) which I had a little bit again this time. The cook must be aware of the nature of the transformation of the coarse material of food into a finer state. In cooking the elements are marshaled to act upon the mineral, vegetable and animal kingdoms, maximizing their potential for human nourishment, for He changes every substance into Soul.